From my recent searches for board games, card games and anything tabletop related, I had discovered ‘Munchkin‘. A game by Steve Jackson – wait a minute, I recognise that name… Ah, yes! ‘Zombie Dice‘, that’s how I now the name! But I knew nothing of the game and, as has been the case with me, I’m reluctant to shell out for a game I have never played nor heard of lest I run the risk of wasting money on a game that gets touched once. On a recent shopping trip to Cardiff, I popped into Rules of Play with the intention of picking up ‘Batman Fluxx‘, ‘Exploding Kittens‘ and, maybe, ‘Munchkin‘. I walked away empty-handed. ‘Munchkin‘ was £55 for the regular edition. Nope. ‘Batman Fluxx‘ was sold out. ‘Exploding Kittens‘ was cheaper online and the box was much smaller than I had expected so definitely not worth the money just to ave it immediately as opposed to waiting for delivery. On a subsequent school run after I dropped the girls off I got talking to my buddy Dan and his wife about the disappointment and he mentioned he had ‘Munchkin‘ and offered to lend me it. I knew Dan was a geek, after adding each other on the PS4 and sharing similar interests in pop culture but didn’t realise he was a tabletop gamer. Excitement filled my gaming loins because I desperately wanted to play ‘Munchkin‘. The idea of a game with roleplay elements without the lengthy set up, confusing rules (and numerous pages to leaf through) appealed to me massively. It was a little while before I got around to playing it as it ended up just being Seren and I playing and I researched two player variants as the game is designed for three to six players. It worked out pretty well. It took a couple of attempts to sus it all out as I always get a little anxious when playing a new game without someone who has played it to impart their knowledge. Our first game ended with me holding about twenty-five cards and Seren had seven. I trounced her after we extended the game to level twenty instead of ten. Something’s not right, I thought. So I re-read the rules and lo and behold! You’re only meant to hold five cards at any given time. I also failed to adhere to the monster cards loot where we took one treasure as opposed to multiple if the cards dictate. Night one was basically getting the feelers out. Night two, it was Seren and I again and this time we played it properly. The key takeaways from night one were fully embedded and Seren ended up beating me. One all. The game was much more enjoyable the second time around. No fafffing around referring to the rules almost every turn to double check and the fluid gameplay led to a far more enjoyable experience. Night three saw a new gameplay element: Dan had included the ‘Adventure Time 2‘ expansion which introduced dungeon cards and character boons. I won game three. But it was close. We played to level ten again and Seren finished on level nine. My confidence in what I was doing was far greater this time and Seren’s was even moreso. She played fairly independently aside from the odd card that she didn’t fully grasp what its purpose or instruction was. Three games in, I decided to buy the game. After seeing the ‘TableTop‘ video (included below), I wanted the deluxe edition…for the board. Seren and I had been playing on sheets printed out to place our armour, weapons, class and race cards and we used coins to track our level progress. This review is based on the gameplay of the regular edition and my first impressions of the deluxe edition. The regular edition consists of the treasure deck and the door deck, a six-sided die (D6) and rule sheet. To track our progress and equipment, I downloaded some printable sheets over Downcast Systems and we used a coin each to track our level. The core set up takes seconds (a minute or two if you want to shuffle the decks thoroughly). The deluxe edition adds the board & player markers. Initial set up took about a minute – popping the card characters out and slotting them into their plastic stands (one-off set up, really) and unfolding the board. Gameplay is simple (yet we restarted a couple of times in game one as we got the feelers out). Each player is dealt with four door cards and four treasure cards. Players roll a die to determine who goes first based on who gets the highest roll. At the start of each player’s turn, the players equip weapons/items/classes/races from their hand (if they have any). Once done, they proceed to “kick down the door” (draw a door card) face up. If it is a monster or a curse it has to be played immediately. At this stage, the curse affects the person who drew the card. If it’s a monster, the player adds up their level (each player starts at level 1) and any bonuses from equipment etc. If their points add up to more than the monster’s level, they win the fight. UNLESS another player plays a card that bolsters the monster’s strength, in which case the initial player has to ask for help (by asking another player to add their level and combat points and any other cards that can assist) or play any other cards like “one shots” such as potions or bombs. If the player wins, they draw the designated number of treasure cards. If they had help, the helping player will usually have negotiated their price and take a share of the loot (take one or more of the treasure cards drawn based on the prior agreement). If, during the “kick down the door” stage, no monster or curse card is drawn, the player adds the card to their hand or they can play it immediately. I’ve played Munchkin three times now and plan to play on the deluxe edition tonight (for the first time). I love the game. In the synopsis above, it lists ‘sequels’ but that barely scratches the surface. There are tons of versions of Munchkin that can be played as standalone games or integrated into others to open up so many possibilities. The simplicity of the game and the ability to easily tweak gameplay elements to create your own variants is fantastic and can lead to a lot of fun to be hand. In our games thus far, we haven’t really back-stabbed or cheated (the game actively encourages you to cheat) but we have still enjoyed it. With only two players, it’s do-able and results in pretty speedy games but I would recommend at least three to try and incorporate an element of strategy. Although, when Seren drew a low-level monster I bolstered it’s abilities to the point she’d have to ask me for help so I managed to plunder some treasure and, as an elf, I managed to level up from helping her and winning the game! This game has quickly become my favourite tabletop game and I plan on expanding my card collection to epic proportions! 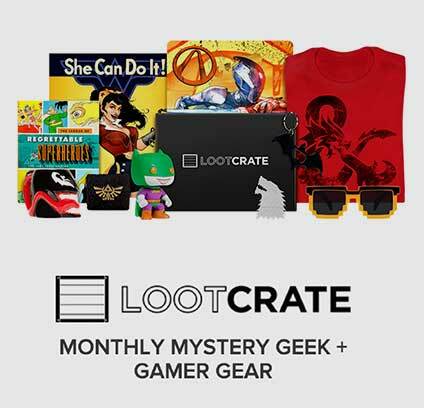 Check out the huge variety of games here. 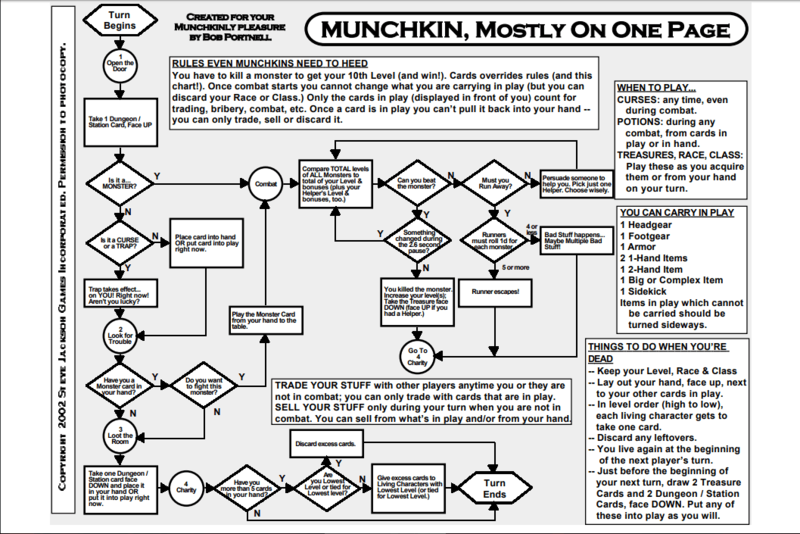 It makes me happy that you found the Munchkin Flowchart useful. The time it has saved and the arguments it has spared us of is phenomenal! So, thank you!